The curators of the St. Catherine of Bologna Patron of the Arts Association along with the Ringwood Public Library present Artwork from The St. Joseph’s Children’s Hospital Binder Autism Center. This wonderful work is now on display in the main floor gallery until May 15th, 2019. 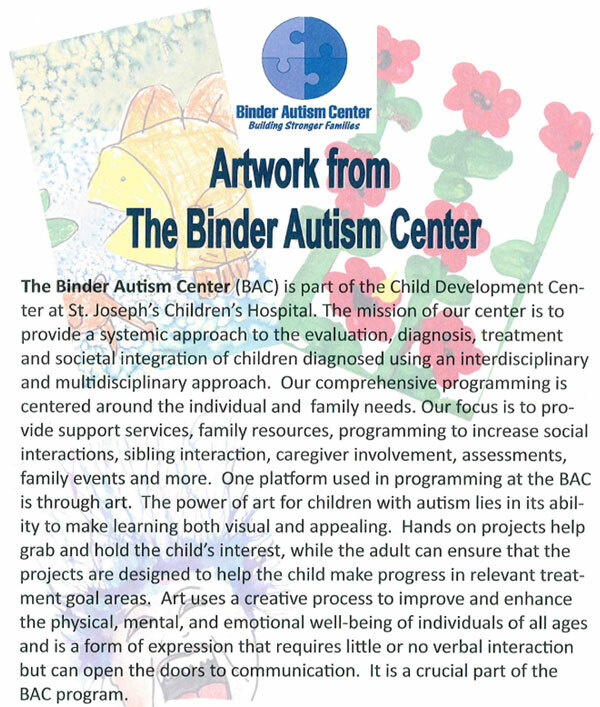 Art therapy can be a great way for parents to bond with their child and understand his or her perceptions. Chartered by the State of New Jersey in 1966, Ringwood Manor Association of the Arts(RMAA) is a non-profit, non-political organization with over 250 members. Membership categories are designed to give all members a chance to participate in the organization, which is dedicated to providing visual arts opportunities for interested persons of all ages. RMAA has an international membership, with the majority of our members coming from Northern New Jersey and neighboring New York state. All officers and directors are volunteers who donate their time and energy to further the Association, as do many of our members. With its home in historic Ringwood State Park, RMAA an Officially Recognized Friends Organization (O.R.F.O.) of the NJ State Park System. The Barn Gallery is located in Ringwood Manor’s Carriage House and offers a showcase for artists of all media. RMAA always welcomes new members and artists. The Wallisch Homestead was bequeathed to the West Milford Township, Board of Education and Library to be used for general recreation and education. It is one of the last remaining properties that reflects Northern New Jersey’s agricultural heritage and West Milford’s past. The Friends of Wallisch Homestead was started in 2013 as a non-profit volunteer organization that seeks to raise public awareness of the historic importance and beauty of the Homestead and its value to our community for future use as a cultural, recreational, and educational center. We believe the Wallisch Homestead has the potential to offer a wide variety of historic, cultural, and recreational uses for both residents and visitors. Friends of Wallisch Homestead are pleased to invite you to submit your artwork for our Fifth Annual Art Show and Sale being held Friday, 5/10 through Sunday, 5/12. lick on the link below for more details. 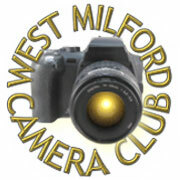 The West Milford Camera Club was founded 1987. Thier purpose is to bring together photographers from West Milford and surrounding communities for a mutual sharing of information and inspiration. They are also happy to respond to requests from our town and participate in its endeavors. During the year they hold meetings at 8:00 PM on the 1st and 3rd Mondays of the month at The West Milford Presbyterian Church at 1452 Union Valley Road in the center of town. A wide range of photographic interests are shared by the members and we keep an open mind toward the various means of creative expression. Exhibitions, workshops, speakers and field trips are some of the ways we keep ourselves involved in the craft. Our 29th Annual Photography Contest and Exhibition will be held on Saturday, May 4th, from Noon until 4:00 PM, at the West Milford TWP Library, 1470 Union Valley Road, West Milford, NJ. Entries may be dropped off at the library on Fri, May 3rd, between 6:00 and 9:00PM. We are a registered 501(c)(3) nonprofit organization. Our mission is to foster and promote the artistic and cultural vitality of Sussex County. We do this by: Providing an art gallery where our members and other artists can display and sell their art Arranging art exhibits in other local galleries and businesses Supporting 21 Sussex County organizations with programs in visual arts, history, music, theater and social welfare by allocating and administering grant funding provided by the State of New Jersey. We invite entries for the 32nd Annual Skylands Regional Juried Art Exhibit. The exhibition is open to all artists eighteen years of age or older. Entries in all fine arts media, including photography, sculpture, and digital art, are accepted. Cash Prizes will be awarded at this prestigious event. Entry Deadline is Thursday March 6, 2019. The Exhibition opens May 18, and closes June 22, 2019.